Singapore Airlines has launched two new direct routes to Houston, Texas and Singapore from Manchester Airport. Manchester will be the only airport outside of London to offer both destinations, underpinning the airport’s role in the Northern Powerhouse. The first flight to Singapore launched this morning and the inaugural flight to Houston departed on Sunday 30 October. 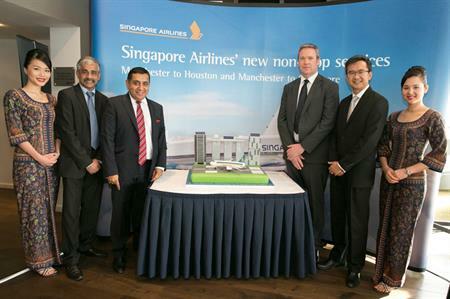 Speaking about the launch, Singapore Airlines vice president for Europe, Subhas Menon, said: "Our new non-stop routes to Houston and Singapore from Manchester are the first outside of London to offer travellers more convenient travel to Texas. We are committed to this region and want to continue to develop Singapore Airlines relationship with the people and businesses of the North West. With our partnership with Flybe, these routes are also open to travellers from 11 cities across the UK including Aberdeen, Edinburgh, Glasgow and Inverness".